The genesis of baking through Dorie Greenspan’s Baking Chez Moi was cooking through her “Around My French Table” every other week on Fridays. The group was known as French Fridays with Dorie, which, though I did pick up the book, I learned about too late to really jump into (though I am working through at my leisure). There is a new group afoot, however, dedicated to working through David Lebovitz’ “My Paris Kitchen”. This week’s recipe was delicious. I picked up a rib eye from Petty’s and had them slice it in half, searing it for about 2 minutes per side on super high heat (choking all the way from the smoke), which retained the lovely meaty richness of the steak. The chipotle pepper gave a nice mild kick, which brought out the previously unnoticeable smokiness in the 2013 Beringer Cabinet Sauvignon which we paired with it. The juiciness of the wine also complemented the heat of the seasoning. The crispy seasoned (oven baked!) fries were delicious… I used rosemary and sage from my little balcony garden. I am looking forward to this challenge for the next couple of years, and hope to see you at the table! It isn’t too late to join here, so pick up a copy and start cooking! 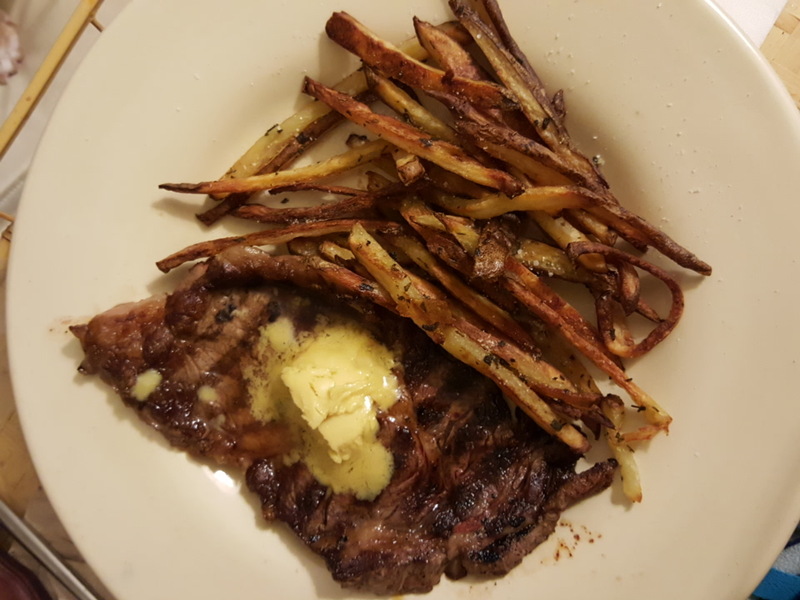 This entry was posted in Meat, My Paris Kitchen | David Leibovitz and tagged David Leibovitz, Dinner, My Paris Kitchen, Steak. Bookmark the permalink. I have never used chipotle in anything before, I didn’t realise that it was a smoky flavour. I’m glad I found it though, I liked the rub and will try it again! I just watched a Top Chef episode where they had to match their food to a wine, sounds like you would have been on a winner here!!! I thought that chipotle was just smoky without the heat so was surprised by the heat. I liked it though! Your steak frites looks perfect! I especially love how beautifully crispy your fries are. Isn’t it nice to have an herb garden, no matter how small? I’ve got a gorgeous ten-year-old rosemary plant and thyme that returns each year. With our very mild winter, my oregano even survived the winter. I’m keeping my fingers crossed that my tarragon plant will reappear, too. So lovely! My rosemary plant is fledgling right now… I picked it up during Christmas and it is doing quite well. Definitely a benefit to living in a warm environment! Wasn’t this a great dish!? I’ll be making again for sure! And hey, even before AMFT, there was Tuesdays with Dorie, baking all the way through Baking from my Home to Yours – the Doristas have been around for a very long time now! Your fries look amazing! So perfect! Actually, the entire plate looks great, Nicole. It’s been a few weeks since I made the steak and have been considering revisiting it after reading everyone’s posts. So glad you are joining us!! Thank you! So excited to join… and yes I could easily see making this on a semi-regular basis… it was that easy! Your fries look yummy., this was a great meal- wasn’t it? So glad to see you here as well! And early on so I only have to backtrack on the winter salad! Everything looks scrumptious, this was a really great little meal, wasn’t it? Love your photo, Nicole! Your steak looks absolutely perfect! So glad you decided to join us on cookthebookfridays! It really was a great meal! That looks wonderful, particularly the fries! I’m glad you’ll be joining us in cooking through My Paris Kitchen. Thank you and I am glad to join!